Anne Meara as Veronica Rooney on "Archie Bunker's Place"
She may be best known right now as Ben Stiller’s mom, but to me she will always be Veronica Rooney, Archie Bunker’s cook when he and partner Murray Klein bought the bar Kelsey’s. A few weeks ago, Facebook told me that Meara’s family was reporting she had passed away at the age of 85. By the 1980s, “All in the Family”, which had made Carroll O’Connor’s character Archie Bunker a household name, had begun to run its course. Rob Reiner, Sally Struthers, and Jean Stapleton, the other three main cast members, had all left or were in the process of leaving. So, Archie bought his favourite hangout and Archie Bunker’s Place was born. Along with the name change came a whole new cast, led by Martin Balsam as the aforementioned Murray Klein. That’s when Anne Meara, who I had never seen before, joined the cast. She played Irish cook Veronica Rooney, who was also a recovering alcoholic. One of the most touching episodes I recall featured a visit by her ex-husband, played by none other than her real-life husband Jerry Stiller. They end up back at her place where he convinces her, after she does resist, to have a drink. It spirals into a bender from there. The next thing we see is both of them passed out on the couch, before they even have a chance to sit down to eat the meal she had lovingly prepared. She awakens to find, of all things, a spoon in her bra. She has to get ready for work and says they will do what they always did before. They’ll have the main course as leftovers and eat dessert for breakfast. Ultimately, since she has turned over a new leaf, she has to cut loose the love of her life. It proved how good an actor Jerry Stiller actually can be. We already knew how good Anne Meara was. Anne Meara had already had a successful career when she joined “Archie Bunker’s Place” and would go on to have more success, including a Writers' Guild Award for co-writing “The Other Woman” in 1983. She would continue to act, often along side Jerry Stiller in shows such as “The King of Queens” and various comedy reincarnations of their act. Together, they also had two children, including son Ben, who seemed to eclipse his parents. Most people seem to know Jerry Stiller from his energetic roles as George Costanza’s father in “Seinfeld” and Carrie Hefernan’s cantankerous father in “King of Queens”. Yet, few connect him with Anne Meara. I even wondered if they were still married. Personally though, I saw Anne Meara long before anyone named Stiller, neither Ben nor Jerry (and I am resisting an ice cream joke right now). 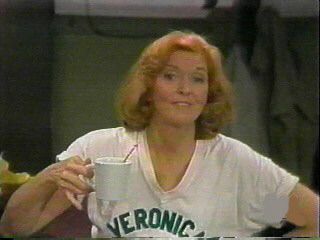 She will always be Veronica Rooney to me, the cook at Archie Bunker’s Place. It was a role with many layers, from the sarcastic wit of the Irish-American, to the poignant sadness of the alcoholic beating an addiction when the love of her life could not. That’s what made both “All in the Family” and “Archie Bunker’s Place” so good. They both mixed comedy, satire, and wit with drama. Once Gloria, and Meathead, and Edith moved on, It was Murray and Billie and Veronica Rooney who took over, and they were just as good – just in their own way. In the midst of it all was that Irish-American cook with the sharp tongue. Rest in peace Anne Meara. Your role was one of a kind.